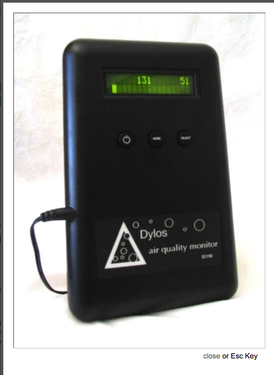 Optical PM monitoring of Particulate Matter (PM) is an attempt to measure the diameter of particles in flight. 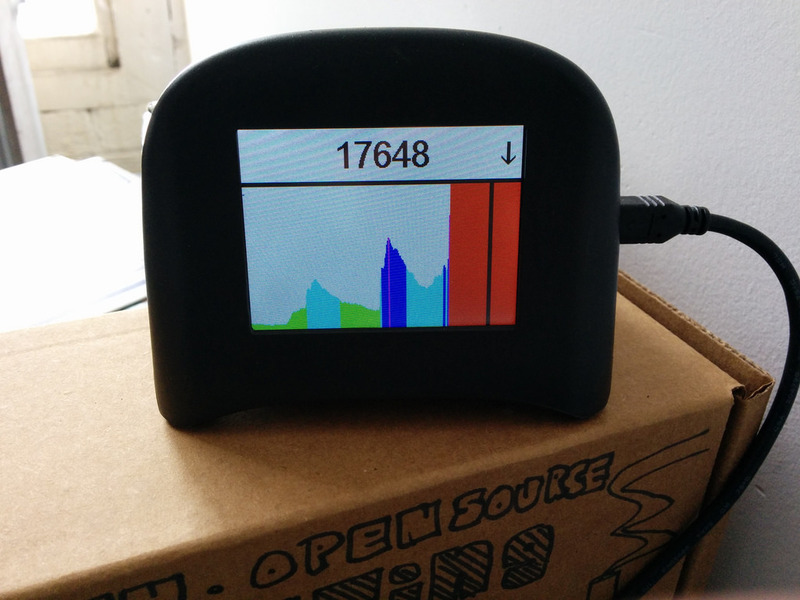 Optical monitors are a low-cost way to get real-time data about particles in the air. They are an automated, electronic version of the effect seen in a darkened room by light glinting off of dust in a sunbeam. A number of comparison tests of commercially available sensors have been performed or are underway. Please add to this list if you know of other comparative evaluations. A sensor and a beam of light sit at an angle to each other. As a particle passes in front of the light, some light is reflected towards the sensor. 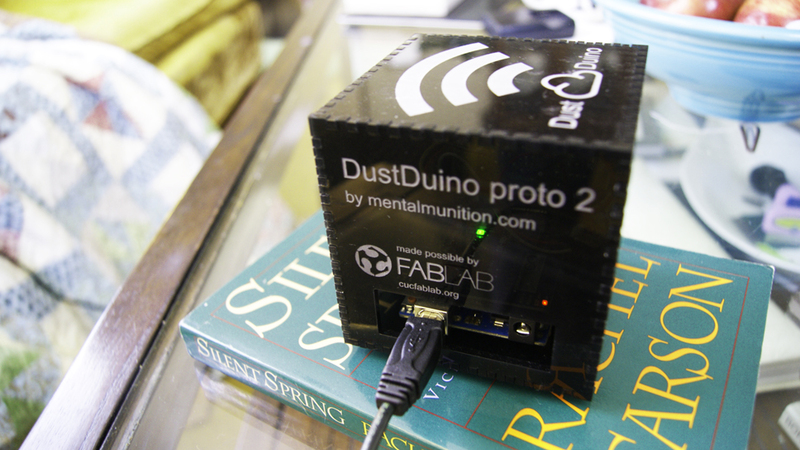 The sensor registers a pulse for as long as the particle reflects light to the sensor. 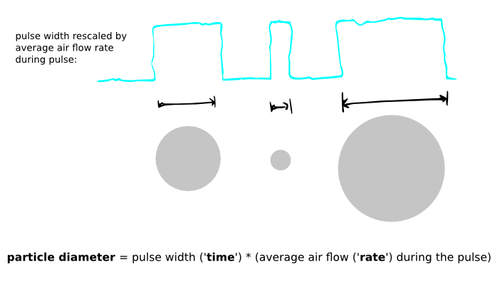 If the air is moving at a consistent speed, the length of this pulse can be used to estimate the particle’s diameter. Read more in-depth in this illustrated post by @DonBlair. With an estimate of particle diameter and an estimate of average particle density, airborne concentrations of PM can be extrapolated. These estimates are somewhat imperfect, as accounting for particle density and the estimating and accounting for the quantity of water in droplet mode particles is not straightforward. Both of these issues complicate the process of correlating optical PM measurements to regulatory monitoring. Optical monitors detect droplets and dust, and droplets are often ‘wet,’ having absorbed water in the humidity. Humidity measurements are frequently used to correct for the expected effects of humidity on droplets. These corrections are based on assumptions about the percentage of dust that is in a droplet mode and succeptable to wetting, and the percentage that is dust. Most low-cost optical monitors assume a standard particle density based on a ‘test dust,’ such as the standard “Arizona Road Dust,” now ISO 12103-1:1997. Read more on the history of test dust in this article from Powder Technology. Some more expensive optical monitors combine and optical monitor with a filter-based PM monitor. The filter is weighed (‘gravimetric analysis’) before and after sampling to create a calibration factor for particle density. PM regulatory standards are technology-based, meaning that measurements of PM10 must be related back to the results from a specific PM10 monitor. 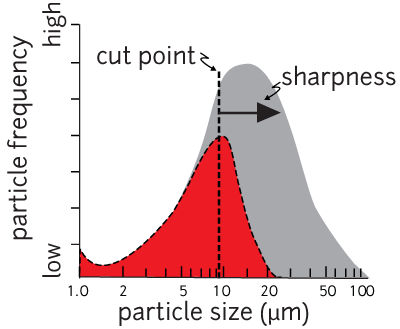 While optical monitors can set a ‘sharp’ cutoff of particles, filter-based Federal Regulatory Methods depend on the mechanical sorting of an ‘impactor’, which has a less sharp cutoff. The average mass concentration is discrete integral of the individual particle’s contribution to mass concentration, multiplied by a curve for respirable PM10 and PM2.5. Both Dusttrak and pDR-1500 have a filter for "gravimetric analysis" (weighing the quantity of dust collected) as an additional calibration. Currently there are only proprietary commercial services available for reading commercial sensors, such as Netronix, which costs around $100/month. Here we will examine four in-development projects using almost identical sensors (Shinyei PPD42NS, Syhitech DSM501A, Shinyei PPD60PV ) and a low-cost commercial competitor with a similar design, the Dylos. 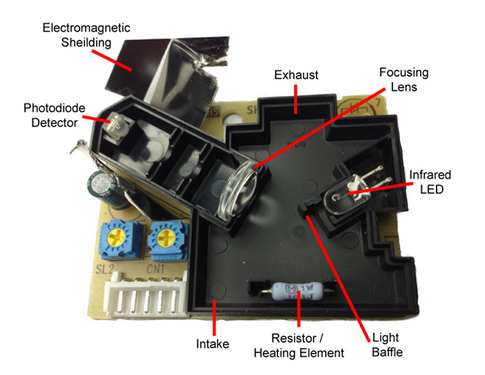 Current efforts to correlate low-cost sensors with commercial reference sensors, and each other are available. AQICN’s effort appears the most comprehensive Others include: AirBeam, Sonoma Tech, Gao et al. 2015, Holstus et al 2014, Purple Air. Thanks to @Willie for many of those links. Passive airflow: a system that doesn't actively control for airflow, either using natural or thermal convection to drive particulates through. Active airflow: The use of a fan or pump to control and/or meter airflow through a sensor. Nothing yet on the topic "dylos" -- be the first to post something! by Carnegie Mellon’s CREATELab, my previous notes. hooked up to their open source fluxtream platform and designed for home use, it's being used by the Southwest Pennsylvania Environmental Health Project. Nothing yet on the topic "speck" -- be the first to post something! developed by the HabitatMap, it is designed to hook to an android device. It is open source hardware and uses a small fan. 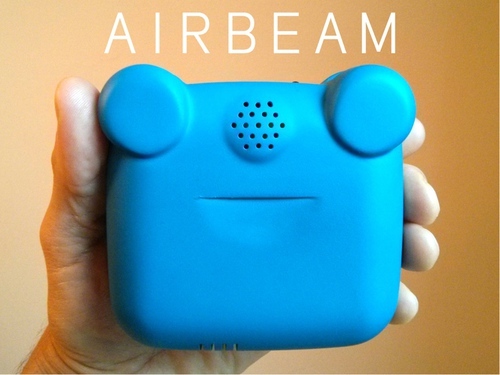 Nothing yet on the topic "airbeam" -- be the first to post something!